There is an absolute ton of stuff packed into this issue. We have Medusa’s grief at the loss of her husband, Black Bolt, and her son, Ahura. There is Captain America coming to talk to her about what she’s going to do with the whole mess of Attilan crashing into New York and the Terrigen Mists being released. There’s Tony Stark and T’Challa talking about the growing wave of new-bred Inhumans thanks to the Terrigen Mists. There are the attacks on convoys transporting and governments who are harbouring cocooned new-bred Inhumans. And we have one of the first acts of reprisals by the Inhumans against those humans who wish them harm. Lots of characters. Lots of situations. Medusa kind of gets lost in all of it. One thing I liked was that we got to see a personal side of Medusa. Her grief feels very real and her come-about later on is the kind of thing that I expected of her. But, given what else is packed into this comic, her personal story doesn’t quite get the treatment that I was expecting. Her conversation with Captain America is a good example of that. And Fraction treats this conversation as an info-dump, which was annoying. I really have no interest in reading again and again how and why Attilan fell and what the Terrigen Mists are doing to humans. Let’s move on from that already! Plus, while I liked her come-about, there is a distinct lack of energy in her, as seen through the dialogue. Her people are being directly threatened and while she is out in the field to take care of such treatment, her heart doesn’t really seem to be in it. Its as if she is performing by rote. Or just doing whatever is expected and that’s that. I want to see more from her. This issue is little more than a setup to Soule’s Inhumans so that obviously muddles thing up a little bit since its been made clear by Marvel that they didn’t like the story that Fraction was doing and that was why he was taken off the title and why Soule was brought in. I’m somewhat concerned how that switch will affect the series, more so since I’m not exactly all that big a fan of Soule’s work, but I’m open to it. I just hope that Medusa’s characterisation and the plots introduced in this issue aren’t wholly left by the wayside, and that we get to see some consistency. Speaking of the art. Its really gorgeous in some place and really tedious in other places. Since this was originally a one-shot that was later retitled, the art team here is different from that on Inhumanity #1. Nick Bradshaw and Todd Nauck do a decent job here, but the switch between their artwork is jarring and it immediately pulled me out of the story. It also doesn’t help that there are 4 inkers and 2 colourists here. The art styles seem to change every few pages and that was even more distracting on top of everything else. 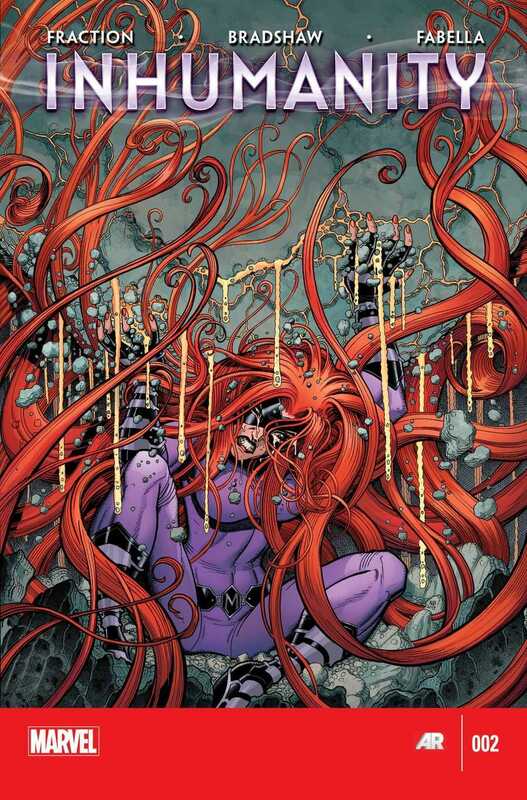 I loved a lot of the scenes with Medusa, especially where the panels are divided by her long hair, but one thing that stood out for me was that a lot of the times she is shown in what I’d call a supermodel pose. Like its just for the effect and nothing else. Kinda weird. Overall, decent enough story with decent enough art. I’d like to see more but I’m not sure if that’s gonna happen. More Inhumanity: #1; (Superior Spider-Man) #1. Posted on February 2, 2014, in Comics Reviews, Review Central and tagged Andres Mossa, Antonio Fabela, Attilan, Captain America, Comics, Comics Review, Inhumanity, Inhumans, Marvel Comics, Matt Fraction, Medusa, Nick Bradshaw, Queen Medusa, Review, Review Central, Science Fiction, Superheroes, Terrigen Mists, Todd Nauck, VC's Clayton Cowles. Bookmark the permalink. 7 Comments.